The life of José Miguel Bonet (Ibiza, 1981) is closely linked to Es Ventall, a family restaurant that his father opened the year José Miguel was born. At the age of 17 he was already helping his family in the business so that it comes as no surprise that he points to his father, in charge of the kitchen until 2005, as the person who influenced his cooking most. It is in 2005, precisely, when he takes over the restaurant after a training tour that would take him to different parts of the peninsula. From the Hoffman’s cookery school in Barcelona to Casa Solla in Pontevedra (the chef Pepe Solla, awarded with a Michelin Star and three Repsol Suns), without forgetting the lessons of Felipe de la Peña (Balearic Employment Agency’s Training Center). But, as reminded by this representative of the modern Ibizan cuisine, his training is an ongoing process since he enrols on a two-day pastry course as keenly as he attends a sous-vide cooking course at El Celler de Can Roca. Since having taken over Es Ventall, a reference of the traditional cuisine in San Antonio for many years, he has been trying to innovate and modernize the gastronomic offer without betraying the roots nor cutting with the tradition. As recognized by José Miguel Bonet himself, Es Ventall ‘sails between two waters’ and it is sometimes difficult to maintain the balance, but although the workload and the clientele have both grown since he’s been in charge, he admits that some of the regular customers stopped coming. This is due to the fact that many people are still surprised and ‘afraid of the unknown,’ argues the young chef. 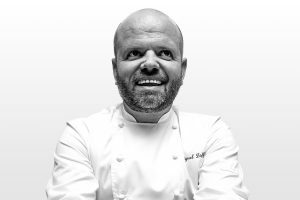 However, José Miguel Bonet does not consider himself a ‘radical chef, fanatic of liquid nitrogen.’ ‘I’m a traditional cook, I do traditional cuisine with seasonal produce, yet applying 21st century techniques,’ he says. One such technique he practices is cooking at low temperature, which maintains the properties of food. 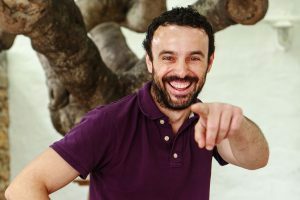 He likes reinterpreting dishes from the traditional Ibizan recipe book while he acknowledges that some of them cannot be changed because ‘they have too much personality’. Constantly struggling to find the balance between innovation and tradition, he understands that what is needed is honesty while dealing with new dishes in order to avoid betraying the roots of Ibiza’s gastronomy. The regular clientele of Es Ventall has evolved and is gradually accepting the shift that José Miguel Bonet attempts at, and at the same time there are new customers who demand this renewal marked by the latest trends of modern cuisine. And so, ‘sailing between two waters’ he stays afloat. But tradition is still present and it is a hallmark that Es Ventall cannot miss. One proof of this is the wood oven, ‘the soul of the restaurant’, as noted by the chef showing it proudly. Of course, he admits he would like to combine it with a modern part incorporating the latest appliances, so he does not rule out having a service kitchen and a production kitchen someday, ‘like great restaurants do’. 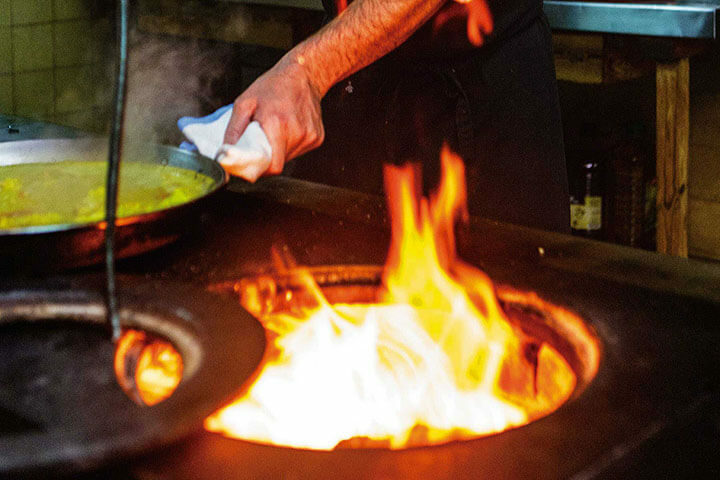 It is clear, however, that wood is one of the distinctive features of Es Ventall’s gastronomic offer and yet an added difficulty that the restaurant’s staff faces. 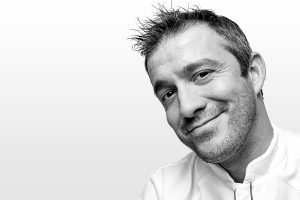 ‘We do not have thermometers here to know what temperature has the grill reached and you need to get used to it,’ says José Miguel Bonet. This is why the freshmen stick to traditional gas hobs at first, until they gradually get the hang of the wood. Of course, there’s no comparison to lamb roasted in a wood-fired oven or rice cooked in the coals. 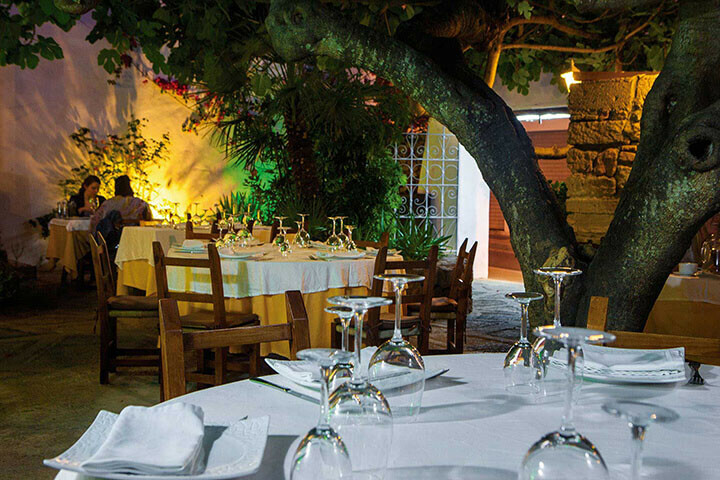 How do you perceive the present Ibiza’s gastronomy? It has evolved a lot. The gastronomic boom nationwide has done us a great favor. People know us now and have an interest in gastronomy. Before, the cook’s role was a secondary or tertiary one in terms of recognition. The arrival of great chefs to Ibiza is good for the island. It benefits us all for Ibiza to appear in the press and to be a topic of conversation. It’s good that the presence in Ibiza of Paco Roncero, Ferran Adrià or Sergi Aro is being commented on. Besides, it attracts consumers with high purchasing power and although they won’t become my clientele, it benefits all of us. Do you think Ibiza can become a gastronomic centre of reference? We are on the right track but it must be a long-distance race. The arrival of a couple of Michelin-starred chefs does not suddenly turn us into a national point of reference. There’s a need for the institutions to carry out marketing and promotion activities through conferences, trade fairs, etc., and it is very important to have a good cookery school where well qualified professionals can be trained. This means many years of work involving institutions, restaurants and hotels for people to take us into account. But founding a cookery school comes first, so that people do not have to go to Palma. Are all chefs seeking the Michelin Star? No, not all. What I seek is recognition from my customers and to work in a way that makes me feel fulfilled and that I’m doing things right. This kind of recognition is certainly gratifying but my ego does not compel me to have a Michelin Star. Which of Ibiza’s restaurants do you believe deserves a Michelin Star? There are many who aspire to it. Can Curreu has good service, it is a restaurant with good facilities. S’illa des Bosc in Cala Conta goes this year from being a beach restaurant to take a new turn in Ibiza through which they may try to achieve it. Iñigo from Pacha Hotel has been doing a good job for years and could be a strong candidate… The problem is that the Michelin Star is not a one-year thing, it is a matter of 4 or 5 years and that continuity is what lacks in Ibiza in many cases because the restaurants change cooks frequently. Which has been your best culinary experience? At Disfrutar, the restaurant that Oriol Castro opened in Barcelona. I was recently there with Iñigo—Iñigo,,,,,, from Pacha Hotel—and we had a great time with a menu of 24 snacks which varied from very simple things to highly elaborate tapas. But I have also experienced big disappointments and felt confounded by restaurants that are supposed to be very good. Where do José Miguel Bonet find inspiration for developing new dishes? It depends, sometimes I study things thoroughly and sometimes the ideas come in a most silly way. I may sit and reflect on how to reinterpret a traditional dish or may be talking to a housewife and she gives me an idea for a new dish. Who or what has influenced your cooking most? My biggest influence was my father, with his attention to the importance of sauté and powerful bases. I got trained in many places afterwards but I have no clear influencer. My father’s dedication and the love he showed for the restaurant is what impressed me the most. He instilled in me the sacrifice and the effort to achieve a goal. How do you select your team? By the way they work, I need young people willing to work, to contribute. The way they work is what I focus on most, the curriculum is not so important. I observe them for 15 days, a legally allowed trial period, and make a decision based on how they work. What do you recommend to us from your restaurant? Rice, and that you let the kitchen surprise you with everyday’s suggestions. What would be your star product? There are so many… the Majorcan spreadable sausage sobrasada, royal cucumber or any freshly caught fish. Any product that is not highly valued such as red mullet, ray, almond cake gató, which may be considered seconds but are spectacular if you prepare them well. 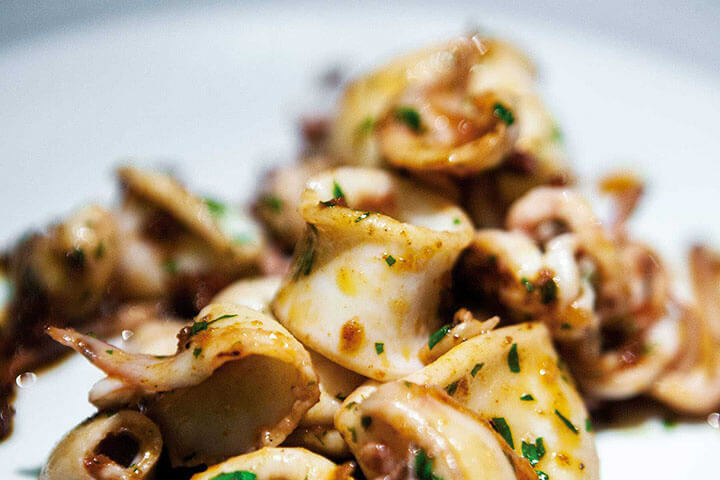 Mix some sobrasada with a little bit of onion and a good squid and you get a filling and very tasty meal… Sometimes there’s no need for great elaboration or great products to make a great dish.